All night the snow fell in big fat flakes, layering our streets with glittering magic. It was the first snow of the season. A blizzard they said, causing us all to scurry to the gas stations and supermarkets for water, milk and wine, you know, the necessities. After Hurricane Sandy, we don’t take chances. When all was said and done, we got about 15 inches. I’d love to say my children were jumping up and down with glee, too excited with the fresh powder to contain themselves, but really, it looked like any other Saturday morning in my house, with them in their undies and their eyes glued to multiple screens. They gave the snow barely a passing glance till their allotted game time and mommy service of pancakes, cereal and Nutella toast had run out. Then finally, as they came to life, the snow did for them as well. They waited impatiently until Howard finished clearing our walkways with a borrowed snow blower. It was the first time I’d seen my husband pushing the contraption. Something about it evoked suburbia more than any other thing I’ve seen him do in the eight years living here. I almost expected a neighbor to walk out and hand him a cup of cocoa. Wait, was I supposed to do that? Finally, Howard finished and it was time for sledding. That’s when the real excitement began. Thermals, socks and hats flew all over my hall, and the children fidgeted with now unrestrained eagerness. “I can’t find my boots!” Michael wailed. “This suit is hurting my marshmallows.” Julius complained, tugging at the crotch of his snow jumper. “Oh, your marshmallows?” The older boys taunted and danced around him, swatting him with socks. Do something? I was in the middle of the mess as well, getting them clothes, shoving their bubbling boy excitement into snug little suits. Trying to contain them was like trying to stop corn kernels on high heat from popping. But I still had the picture of him out blowing snow while I played on the computer, so I tried harder to get them organized. Now if I could only find Michael’s boots. I looked around the mess of crap, searching. My husband looked more aggravated. Tyler and Julius were stomping around the house, fogging up the screen door like dogs, impatient to be let out. I was at a loss. I checked all the places I thought they should be. We hadn’t worn our boots yet this year, so I had searched for them just the other day to make sure we were prepared. I even went to the store yesterday to pick up a new pair for Tyler who had outgrown his. I really thought I had a pair for Michael. Sensing trouble, I raced upstairs to look again and found a pair that might still fit Julius. If Julius’s pair, which was Michael’s last year, would still fit him, maybe we were in business. Julius’s boot was tight on Michael. He complained even before we tried pushing his foot down. Julius was more game. Like Cinderella’s step sisters, he tried with all his heart to shove his foot into a shoe that was clearly too small. Didn’t matter. Michael wouldn’t even put them on. “No! I don’t want to buy boots!” Michael screamed. Howard blows up. “Fine! Don’t go! Stay home!” He stomped out. Julius and Tyler followed. Michael melts down. Crying, he throws all the ill-fitted shoes at him as he goes for the door. I run upstairs in a last ditch attempt to find the boots I know were there. And then, a snow miracle. Quickly, I help Michael get the boots on. Howard, of course, really hadn’t gone. He wouldn’t leave Michael. Michael is finally ready. The other boys are already in the car. Calm has been restored. Me? “Uh, I’m not going?” Not me. I’m no good in snow. I get so cold. I just wind up sitting in the car with the heat on. I’ve learned. It’s no fun for me. Nope, not going. I grit my teeth, waiting for the backlash, but he just looked annoyed and left. For about a minute, I feel guilty, but only for a minute. I pick up the accumulation of clothes covering my floor. It’s so peaceful now, inside and out. I get myself that warm cup of cocoa and happily sit down to write about what the snow blew in. we’re’s the snow blower? wait, i guess that’s me. Posted in Every Day Scoops, Uncategorized and tagged blizzard, meltdowns, Nemo, parenting, sledding, snow, snow blowers, snow boots, Yeah write. Bookmark the permalink. I know, plus I am pretty sure some of the top ones found a way to cheat. I am at 42/43 ish and people are voting religiously. I know we both have large audiences, bigger than most of them… so I connected the dots. We got about two feet in Westchester, and when I was outside with a shovel trying to dig us out of the mess that the plows left behind while my husband salted our front walk and warmed up the cars, my head was screaming, “I am suburban now.” Quite the shock to the system after eight years in Manhattan and only three months into our suburban tenure. welcome to the burbs!! it’s trial by snow! it’s definitely an experience the shoveling and all, but at least now the weather has been mild. a little more east than me, was like you guys 2-3 feet. they are still a total mess! that is true! i don’t know how they wound up in my oldest son’s closet. i can’t imagine someone else in my house actually putting something away! 😉 maybe i had a senior moment. You can always call us, no one has more gear (in EVERY size) then us!! I’m passing this to Steve. Hopefully he’ll realize we aren’t alone 🙂 I often think we are actually the same person. I think I’ve lived these exact moments! Eerie how similar our households are! And that cup of cocoa in a quiet house … bliss. I’m not good in the snow either. This post had really, really excellent story telling. It was so conversational and you did a great job of showing v. telling. You made this mess of a snow storm somehow comical and entertaining. Thanks. Oh, the pressure of finding boots. We dont get snow, or it would be similar drama in my home. Great piece. I love the excitement of them getting all the gear on and the snow miracle. We got three feet–that’s right, three feet!–in central Connecticut. Shoveling the driveway was a two-day effort. It was fun to be snowed in for four days. I kept taking pictures and telling my kids that they’ll be telling their children about the blizzard of ’13 the way I remember the blizzard of ’78, but it didn’t seem to make much of an impression on them. wow 3 feet!! a little further east on the island got 2-3 feet also, but we’re closer in, so not so bad. that is a lot of snow!! bet you wish you had that snow blower! i remember the blizzard of 78! maybe they’ll remember this too. they surprise me sometimes with what they remember. Yes, this is so right. IT’s impossible to keep up with all that gear. Makes me insane. And I do think that it’s a miracle when I find things in my house. come on over baby. i’ll whip em up! at least i know you’d appreciate them! Bundling kids up for snow play is insanity. Zip this, snap that, tie this, find that… Drives anyone batshit, I swear! Loved this! Glad you found the boots. You captured that frustrated tear through the house for the exactly right piece of clothing so well. And I don’t do snow either. Yuck. thanks. and yuck about sums it up! Marshmallows!?!?!?! I LOLed, for realz. I am having snow envy right now, mama. We’ve only gotten a few inches here in Chicagoland. A snow day (i.e., being able to sleep in on a weekday) sounds pretty heavenly. Being a Southern Californian, I just can’t imagine kids mixed with snow! Yay for finding the boots and saving the day! Gawdddd! I remember those days when you’d bundle them up to go out and play. First one then the other. By the time you were finished with the second one, the first was whining due to sweat. 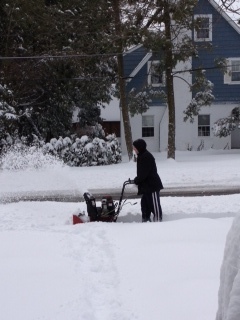 Grrrr…but I love the snow and I’m the official family snowblower because I love it. Glad you got some quiet time!!! that’s the one thing snow is good for!! haha! my kids outside with daddy and me inside enjoying the quiet. So many great little lines in this one…popping like corn, fogging up the door like dogs ready to be let out, haha and marshmallows?!? classic. Indeed, the promise of snow fun turns into chaos! Fun reading! 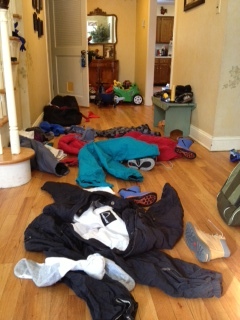 Our foyer is always covered with boots, coats and snow pants and other cold weather paraphernalia in the winter! We had a blizzard with about 18 inches of snow a couple years ago. That’s a lot of snow!